There is no one way to team teach. There is no magic formula for team teaching. The success of team teaching has many factors. 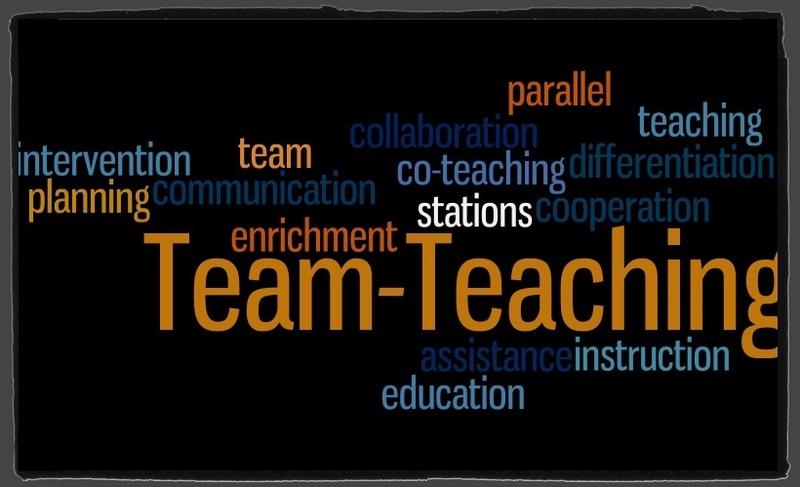 There are many forms and variations of team teaching. Team teaching is a lot of work. My boyfriend is a 5th grade teacher and is going to be “team teaching” this year with another 5th grade teacher. He sent me a text early yesterday morning asking me to help him out and research team teaching for my blog. He came to the right girl. I am very lucky to be in my 4th year with the same Pre-Algebra teacher and we are getting better and better at team teaching each year. So, what will this look like? What are his options? This is like the magician and the lovely assistant, or the hero and hero support. In this situation, the classroom teacher is at the SMARTBoard teaching a lesson on graphing. I walk around the room keeping my eye open for students who need assistance with their graphs. This is a good model to use when, as the intervention specialist, you are not an “expert” in the content or when students are working on something independently. For more on being hero support in the regular classroom, click here. We do this a lot in Pre-Algebra. The classroom teacher will keep the majority of the students and work through more advanced problems and I will take a handful who need more practice on a basic concept. Sometimes this is decided on the spot, after we check our homework. Other times, it is planned out ahead of time based on a quiz, test, or classroom performance. My group may not get as far as her group and sometimes we assign different homework. This team teaching strategy allows us to change the presentation, add strategies, or use alternative worksheets with different groups of students. For example, the larger group may work on Practice C or the Challenge worksheet while the smaller group works on Practice B or another review sheet. Sometimes, the small group will start the independent practice together – doing one of each type of problem on the worksheet to be sure students know what to do for each section. This is also a good time for me to read word problems out loud and work on reading comprehension strategies with those who need it. This works well if you want to provide more individualized attention to students or work in a smaller group setting. We always find it interesting how the participation level goes way up when we split the class. Students who normally do not participate crawl out of the woodwork and hands shoot up when we use this model. This year we have 32 students in our Pre-Algebra block which is a lot of students. A reduced class size of 16 is so much nicer. We don’t necessarily break the class into high/low groups, although we do sometimes split up talkative friends. Our goal is to stick to the same content and get through the same amount of work. Obviously, we each have our own style of delivery, but the student task is essentially the same. This model also works well when we are making some sort of manipulative or graphic organizer. A station where students must evaluate/grade 4 to 5 sample answers to an extended response. We use old test questions and sample answers from the rubrics and students have to determine the points that would be given for each response. Sometimes we both just rotate around the stations as needed. Other times, we each monitor two specific stations. We have also done just two stations – one in her room and one in mine – and we switch halfway through the period. This model is the hardest and will only work in the most ideal situations where teaching styles, personalities, and philosophies blend nicely. It is not natural and it is hard to come by. If we would pull this off successfully, it would almost as if a script was written for the lesson. This takes an immense amount of common planning time, a good working relationship, and I’m going to go out on a limb and say a strong friendship as well. Have you had a good team teaching experience? What models do you use for team teaching? What do you think is the most important thing that must be in place for team teaching to work? It is good but not very realistic if you do not have a common planning time. The teacher I team teach with has her prep in the afternoon and mine is in the morning. I also have three other preps. We stick with the other options usually.